The U.S. Department of Homeland Security issued a request for information on biometric exit. Customs and Border Protection is asking industry for assistance in creating a biometric exit program that provides greater assurance of the identity of departing travelers and provides for more complete and accurate matching of entry/exit records. Customs and Border Protection has biometric exit pilots underway. These include the iris and facial recognition tests at Otay Mesa Land border crossing; one-to-one facial recognition technology from ePassports at JFK and Dulles; using facial recognition to identify travelers as they are boarding an aircraft; and using fingerprint and handheld devices to match entry records when exiting the country at airports. 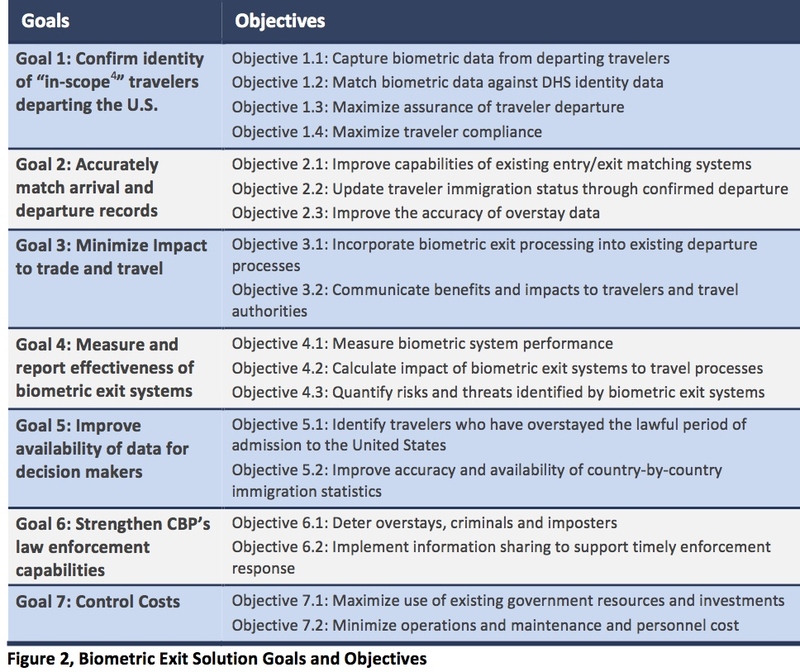 CBP has worked with the Homeland Security Science and Technology Directorate through the Air Entry-Exit Reengineering program to analyze, develop, test, and evaluate integrated approaches to biometrically confirm the departure of in-scope foreign nationals at airports. The results of the experiments will be made available to vendors during the request for proposal process. The government will be looking for industry to propose innovative solutions for Biometric Exit. What contract types should the government consider to accommodate Biometric Exit scope of work? How can government ensure both technical and acquisition flexibility in the new contract since solutions and technology will evolve rapidly over time? What contracting approach should the government consider to ensure competition? What solicitation information is required from CBP for industry to provide a complete and thorough response to an anticipated RFP – in particular, regarding required integration with CBP and DHS back end systems? What investment, acquisition, design and management strategies would be conducive to minimizing technical risk and life cycle costs? How can industry help to standardize and leverage technology / software solutions for use across all airport, seaport and land border POE environments to minimize incompatibilities across systems, reduce development time/cost and maximize interoperability with future systems? What are the commercial practices, products and providers you customarily employ in providing services and solutions described in this RFI? What subcontract / teaming arrangements, including with small/disadvantaged businesses, would you put in place to address the full range of stated requirements? What collaborative activities should government and private sector entities undertake to encourage the development and adoption of open architecture, non-proprietary solutions?